The 10th Annual March to Stop Executions will be held in Austin on October 24, 2009. Each October since 2000, people from all walks of life and all parts of Texas, the U.S. and other countries have taken a day out of their year and gathered in Austin to raise their voices together and loudly express their opposition to the death penalty. The march started in Austin in 2000. In 2007 and 2008, the march was held in Houston. This year, it is coming back to Austin. The photo above, which appeared in the New York Times, is from the 1st march in 2000. The annual march is organized by several Texas anti-death penalty organizations, including the Austin chapter of the Campaign to End the Death Penalty, Texas Moratorium Network, the Texas Death Penalty Abolition Movement and Texas Students Against the Death Penalty. If your organization would like to be a co-sponsor of the 10th Annual March, contact any of the organizations listed above and let them know, so we can list you in future announcements. The first march was called the “March on the Mansion” and was held on October 15, 2000. The second and third marches were called “March for a Moratorium” and were held on October 27, 2001 and October 12, 2002. In 2003, the march name changed to “March to Stop Executions”. Clarence Brandley, who had been exonerated and released from death row in 1990 after spending nine years there, spoke at the 2003 march, saying “I was always wishing and hoping that someone would just look at the evidence and the facts, because the evidence was clear that I did not commit the crime.” The “5th Annual March to Stop Executions” was on October 30, 2004. 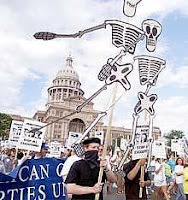 The “6th Annual March to Stop Executions” was held October 29, 2005 in conjunction with the 2005 National Conference of the National Coalition to Abolish the Death Penalty, which came to Austin at the suggestion of the march organizers. The “7th Annual March to Stop Executions”, which was sponsored by a record number of 50 organizations, was held October 28, 2006 and included family members of Carlos De Luna and Cameron Todd Willingham, who both had been the subject of separate investigations by The Chicago Tribune that concluded they were probably innocent people executed by Texas. Standing outside the gates of the Texas Governor’s Mansion with hundreds of supporters, the families of Willingham and De Luna delivered separate letters to Governor Perry asking him to stop executions and investigate the cases of Willingham and De Luna to determine if they were wrongfully executed. After DPS troopers refused to take the letters, Mary Arredondo, sister of Carlos De Luna, and Eugenia Willingham, stepmother of Todd, dropped them through the gate of the governor’s mansion and left them lying on the walkway leading to the main door. The “8th Annual March to Stop Executions” was held in Houston on October 27. 2007. The “9th Annual March to Stop Executions” was October 25, 2008 in Houston. More details, such as the time and route of the march, will be announced later.